Dubai, UAE – October 14, 2018 – Western Digital Corporation (NASDAQ: WDC), a global leader in data storage, showcased its expanded range of AI-enabled edge to core surveillance solutions through its ‘Beyond Surveillance’ campaign at GITEX Technology Week in Dubai. Located at Sheikh Rashid Hall, booth SR-E6, the two-storey booth presented a full range of the latest WD Purple surveillance range as well as hero products from the company’s WD and SanDisk brands. The video surveillance market in the Middle East is growing and this in turn puts the spotlight on storage solutions that support the exponential growth in surveillance data and footage. According to IDC, the amount of data generated by surveillance solutions is expected to grow by 25% per year through 2022 globally. As the surveillance industry moves to higher-resolution cameras and new applications requiring real-time analytics, WD’s full edge-to-core surveillance portfolio shifts focus from ‘seeing’ to safety and insights. Built around the themes of capture, store and analyze, WD has launched three key new products for the Middle East Market at GITEX 2018: the WD Purple MicroSD card (Capture); the WD Purple12TB HDD (Store), and the enterprise class WD Ultrastar 14TB (Analyze). 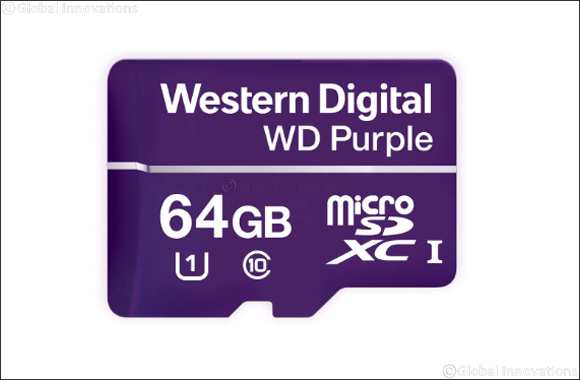 The new WD Purple MicroSD card comes with 24/7 video recording capabilities for up to two years of continuous use. It is also built for endurance, being able to withstand the toughest of weather conditions, and even function seamlessly at extreme temperatures of -25 degrees to 85 degrees. The WD Purple 12TB HDD is a surveillance-class drive with purpose-built Artificial Intelligence (AI) capabilities that support real-time detection of AI-triggered events at the point of capture with continuous background learning in emerging DVR and NVR systems with AI capabilities. It comes with support for up to 64 cameras and Deep Learning technology. The UltraStar HDD is targeted at Enterprise solutions and has 10 times the workload capacity of the regular desktop drives and also includes Deep Learning technology. At GITEX 2018, Western Digital is also showcasing flagship products from WD and SanDisk. For example, the SanDisk Extreme Portable SSD, a rugged and tough SSD that is capable of taking on rain, splashes, spills and dust, while still delivering 550MB/s read speeds and a 2TB storage option. Also on display is the SanDisk 400GB UHS-I microSD card that gives Android users a whole new mobile experience, with faster performance and read speeds. Visitors to the Western Digital stand can also view the recently launched super-fast Black NVME SSD; the WD Blue, Green and Black SSD drives; and the diverse range of SanDisk mobile storage solutions including the iXpand and Dual Drive storage solutions for iOS and Android phones.